World 4- Airship is the Airship course of World 4 in Super Mario 3D Land. 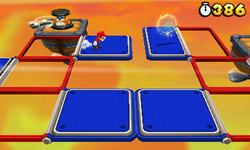 This level takes place at sunset, and has two sections of Reversible Platforms. During the first section, there are two Rocky Wrenches that Mario has to avoid. After Mario gets back on the ship, there will be two ? Blocks which Mario can use to get on top of the Airship and skip part of the level. If the player is unable to do this, they will have to dodge two rolling Skewers and then jump down into the ship's hull. The player can then choose to get the second Star Medal, or keep going to not risk being caught by the screen's scrolling. Mario will come out of the hull and then get to the second section of Reversible Platforms. This time the player will have to dodge a Boomerang Bro. After this, the player will reach a pink Airship with a Warp Pipe in the top of it. If the player goes to the bottom of the Airship, they will find a set of Brick Blocks, one of which contains a 1-Up Mushroom. Going into the Pipe leads Mario to a fight with Pom Pom. After beating Pom Pom, a Warp Pipe will appear, taking the player to the Goal Pole. Star Medal 1: Above one of the blue platforms in the first section of Reversible Platforms. Star Medal 2: After going downwards into the hull the Airship, the next Star Medal is found next to a Fake Block. Star Medal 3: Above another blue platform in the second section of Reversible Platforms.